Julie was born in Kansas City and spent her formative years growing up in the rural Ozark hills of Central Missouri. Surrounded by farming, woods country roads and plenty of wildlife, Julie allows these rich childhood experiences to strongly influence her art today. In 1977, her parents decided to sell off their 20 acre slice of Missouri paradise and relocate the family to the big city of Las Vegas, Nevada. Julie’s father had made a career of playing poker and moving to Las Vegas was his dream. That may have been her father’s dream, but it was far from her dream. She didn’t actually move out west until the summer before her senior year of high school. It was the summer 1978 that she met her husband Brad, graduated from high school in 1979 there and they were married just 10 days later. They were blessed to raise a total of 6 kids together and now enjoying all their grandchildren and their time together in retirement. Julie’s love of art was obvious at a very young age. Drawing, writing and sewing were her constant entertainment but as she moved into the responsibilities and stresses of a working mother, everything art in her life was packed up and and left neglected. It wasn’t until 2010 that she decided to take an drawing class at the community college, followed by an online painting course. That was all the spark needed to rekindle that fire and passion in her heart. With a great deal of hard work, determination and focus, Julie’s work is beginning to be noticed around the country and even internationally. An adjective often used to describe Julie’s art is the word “whimsical” or “childlike”. Julie has a unique ability to combine both details and bright colors to capture her audience and draw them into the piece. She sets out a goal with each work of art to emotionally transport those that view her work to a more innocent and happy time in their lives. Smiles are what she looks for when she is watching those that observing her work and there are usually no shortage of smiling in the room. I'm just a simple artist trying to spread some joy and tell a story with my paintbrush. I adore painting in acrylic paints, but drawing has always been my first love. There is just something about the contrast between the black of the ink and white of the paper that makes me happy. I will often combine the pen and ink with a touch of colored pencils. My work has certainly evolved over the years and I find it so much easier to be colorful and humorous with my art, using bold strokes or thick paint. There is just so much beauty that God has given us in His creation and it is often difficult to decide just what should my next subject to use in my art. This is my journey and with God's help I will strive to honor Him by loving His creation and attempting to capture that beauty with some paint on a canvas. ​MARCH 2017-I'm so excited to have a solo library show scheduled early in 2017. My studio is going to be a busy place as I try to paint 10 new pieces for my Down Country Roads Series. So much fun! I hope you make plans to join me in March at the Whitney Library for my artist reception. 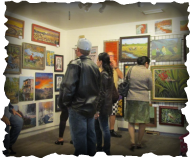 I am honored to the selected the featured artist for the month of April 2016 at the Boulder City Art Gallery. 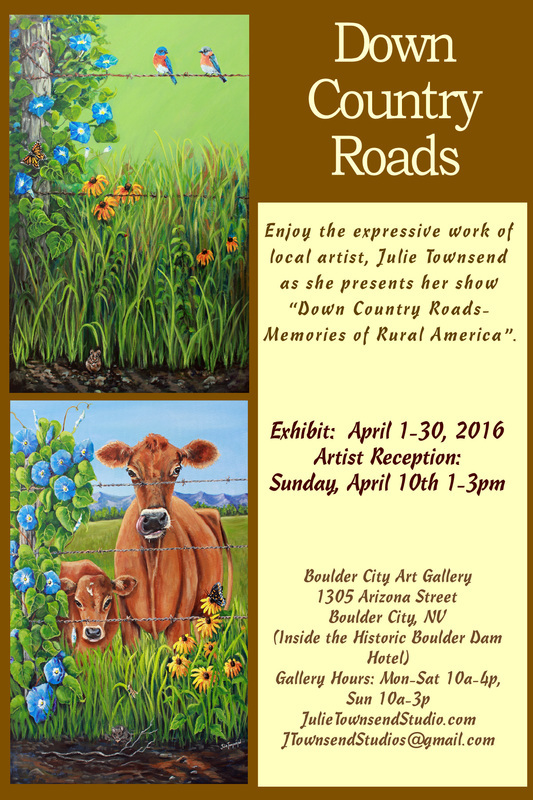 This will be a great opportunity to see my newest series of paintings called "Down Country Roads". 1st Place in the Acrylics Category for my "The Edge of the Herd"
June 26, 2016- Winner of both 1st and 2nd place ribbons at the Elks Club Helldorado Rodeo and Art Show. This is so thrilling as I have participated for the past few years and have never received any special recognition. 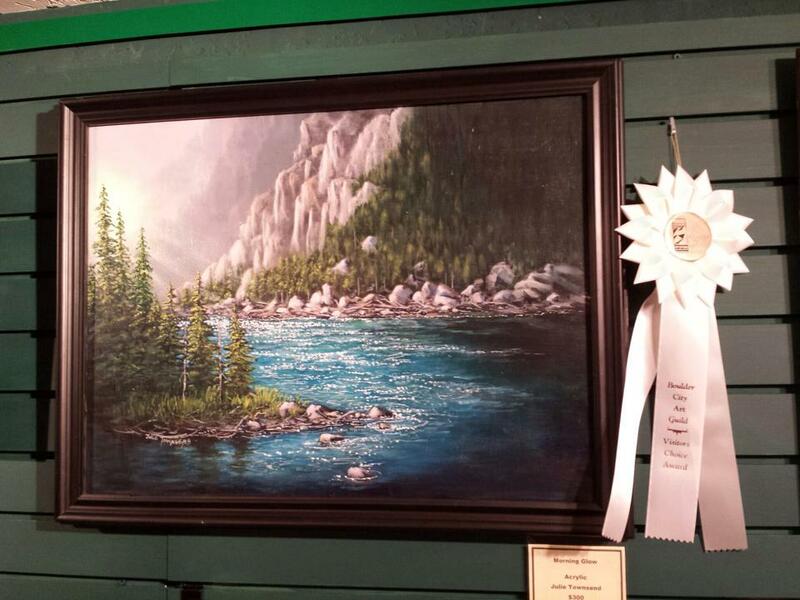 2nd Place in the Acrylics Category for my "Stories Around the Fire"
My piece called "Light'em Up" was given a Judges Choice award at the Clark County Fair in April 2015. 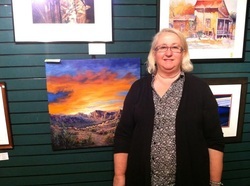 Winner of the Visitor's Choice Award- February 2015 at the Boulder City Art Gallery. Having my painting, Morning Glow be selected by the gallery visitors is such an honor. July 22-Sept 21, 2014 at Centennial Hills Library Gallery. Reception for the show will be held August 10th at 2-3:30. This is my first SOLO show and I'm so excited for this opportunity. I hope everyone makes a point to come out and celebrate with me. 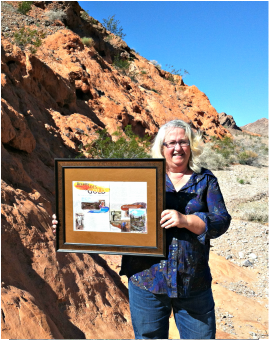 So excited that my art show, "Nevada in Shades of Silver and Gold" has been designated as an official Nevada 150th Statehood Anniversary Event! 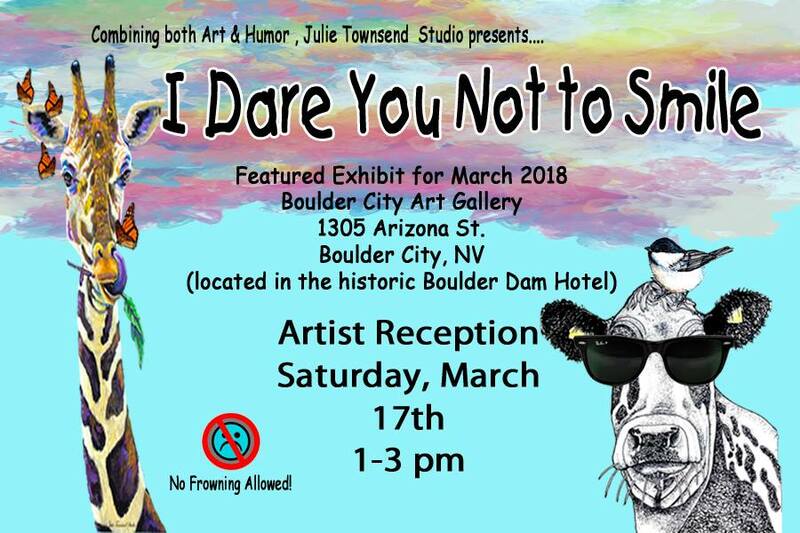 January 2014- I am so excited to announce that I am now showing at Boulder City Art Gallery that is located on the second floor of the historic Boulder Dam Hotel located on Arizona Street in the heart of charming downtown Boulder City. My work feels as if it is a perfect match there and all the artists I have met are so helpful. I feel this is going to be a positive move and I am even more excited to see what 2014 will bring! October 2013-Featured artists Jan Arduini and Julie Townsend-SHOWING THEIR TRUE COLORS at City of the World of the World Gallery. The show was a beautiful presentation given at the gallery and included a total of 33 original works by Julie Townsend and an equal number of paintings by Jan Arduini. Julie's pieces ranged from floral themes to portraits with a few four legged subjects thrown in. I painted this piece specific for this show's theme of Summer. One of the first things I think of when I consider the onset of summer besides the extreme heat here in Las Vegas is all the wonderful fruit that is available. Watermelon is a favorite and there is just something extra refreshing about having fresh lemon slices in your ice water. Because this piece was colorful and bold and not my usual subject, I found it extra fun to paint. This is a good picture of me too! May 2013- 1st Place in the Peoples Choice Category- I entered one of my most recent pieces at the 45th Annual Memorial Day Art Show in Caliente, Nevada and was so surprised to find that I had won the peoples choice award. Not only did I get a fatty ribbon but I was given a one of a kind trophy of "Pahranagat Man" I was also awarded a blue ribbon in the acrylic category for my piece "Casting Out The Darkness". 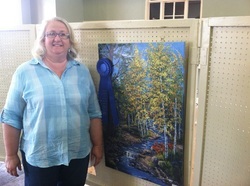 April 2013- Clark County Fair Art Exhibit- 2nd Best of Class and Champion on my piece titled "Fire and Ice"
This has been an exciting week with the publishing of the article in the March/April 2013 edition of Gold Prospector Magazine that showcased my love of painting Nevada. I haven't seen the article yet but Saturday I was out displaying my paintings in front of Wholefoods and I had a man come up and ask if I was the artist in the magazine article. Now that was jaw dropping to me. To top that off, I sold 3 prints on Fine Art America, 2 of which were of "Dreams in Shades of Gold". Finally, last night I received an email request from a lady in Michigan wanting to purchase my original. Way exciting for me. 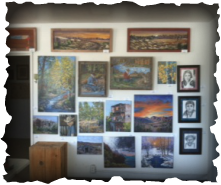 I have joined a great group of talented artists and starting January 2013, a regular display of my work can be seen there during gallery hours. My piece "The Family Tree" received an HONORABLE MENTION at the juried show "Joy" on December 7, 2012 at the City of the World Gallery. 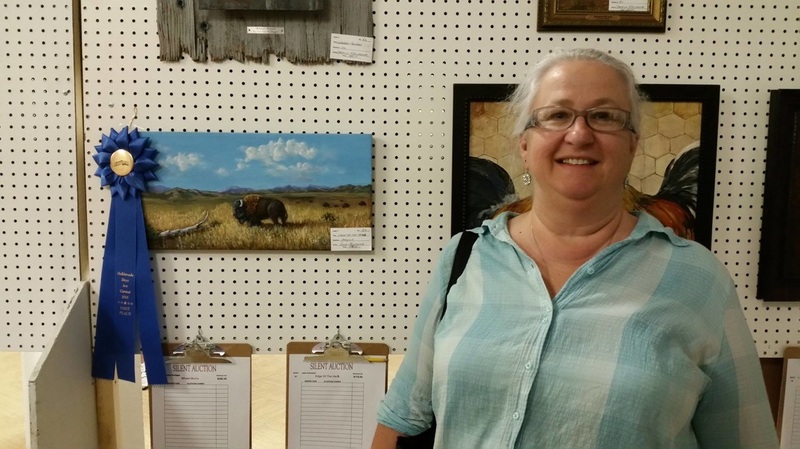 I once again entered a couple of pieces in the Pahrump art show. 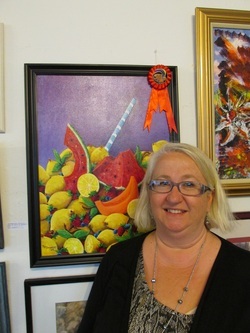 My piece "Dreams in Shades of Gold" won a second place ribbon for the acrylic category. It is always fun to display your work and a ribbon is always a nice addition. It isn't Best of Show but maybe someday. _This show is for artists 50 and over and is put on every year by the City of Las Vegas. For me to just to be accepted in to the show is an honor. 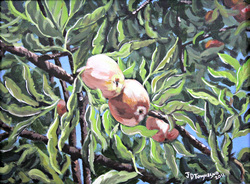 My piece "Season" will be showing there through July 11, 2012. My piece "A Family Tree" will be showing at the Vegas Artists Guild show at Blick Art Supply at 290 S. Decatur Blvd from May 7 to May 27, 2012. Reception will be held on May 20th. _ Imageo Deo is an annual fine arts showcase of Mountain View Christian Schools. This is my second year being able to display my work to the school body. My evening was filled with opportunities to discuss my art with many of the school parents. 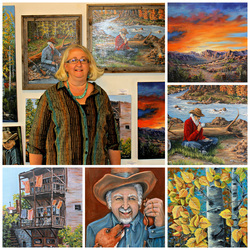 _I won first and second place in the Acrylic category at the Pahrump, Nevada "Wild West Extravaganza" in October 2011. There was a lot of great art represented and I was very excited to be part of it.